What Insects Leave Dirt Mounds? Dirt mounds sometimes erupt mysteriously in lawns and yards, with their architects nowhere to be found. While moles and pocket gophers often get the blame for some unsightly piles, the reality is that mounds just as often result from digging insects. Some bugs are solitary builders; others work in colonies large enough to create truly monstrous mounds. 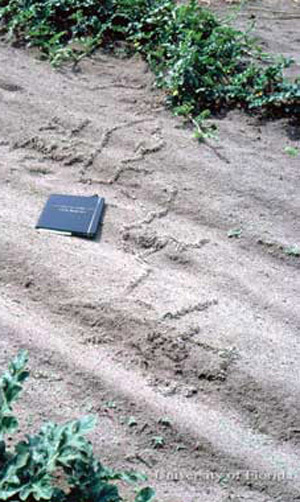 Identify the mounds from their size and shape, and -- in some instances -- by the insect damage to nearby plants. When it comes to mound building, field ants (Formica spp.) are capable of Herculean efforts. One species, the Allegheny mound ant (Formica exsectoides) may build mounds 3 feet tall and twice as wide. In addition to ruining lawns with their mounds, some field ants inject lethal formic acid into the roots of plants shading their nests. They're also capable of delivering painful bites when disturbed. Named for their painful stings, fire-ant (Solenopsis spp.) colonies live in mounds proportional to their colonies' sizes. 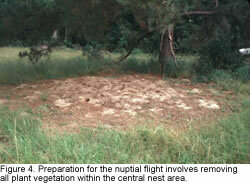 A mound standing 1 1/2 feet high with a 2-foot circumference contains about 100,000 mature fire ants as well as their developing larvae. 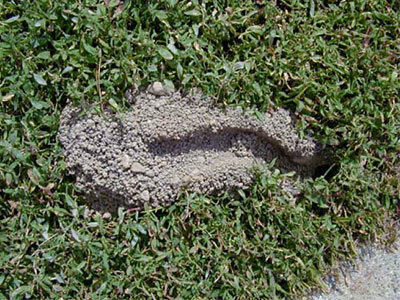 Fire ants build dome-shaped mounds in heavy clay, and less-defined ones where the soil is sandy. Red-and-black pyramid ants (Dorymyrmex pyramicus) have the unenviable job of attacking and killing fire ants. They make craterlike mounds in sunny, open and -- usually -- sandy soil. Also known as town ants for their habit of building clusters of mounds, leaf-cutting ants (Atta texana) have been known to excavate enough soil to cause vehicle-swallowing sinkholes. 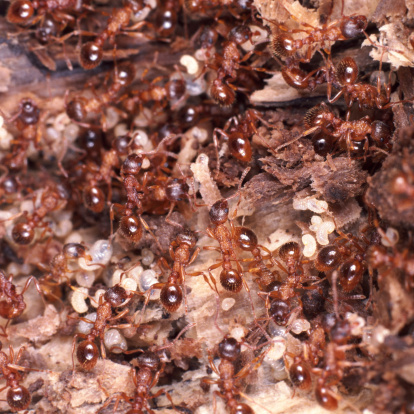 A single colony may eventually reach 2 million ants covering an acre of ground with up to 1,000 crescent-shaped mounds. 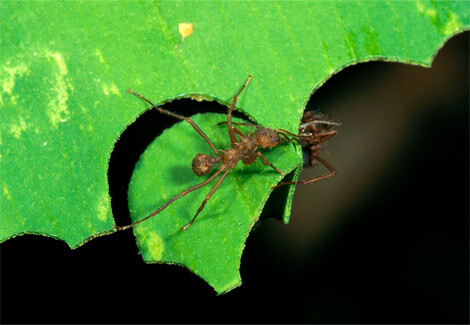 These ants damage plants by removing neatly scalloped bites of leaf tissue. Many varieties of bees have abandoned hive culture for a solitary lifestyle, mating and laying eggs in underground chambers, where they cache nectar-and-pollen "bread" to feed their future offspring. The excavated soil forms small mounds with clearly defined holes for the new adult bees exit the following spring. Tolerating the mounds isn't much of a price to pay for the job digger bees do pollinating spring-blooming plants. Periodical cicada larvae (Magicicada septendecim) spend between 13 and 17 years from 2 inches to 2 feet underground before burrowing toward the soil's surface. If the soil feels too damp when they're 1 inch from freedom, they stop ascending and construct small dirt turrets to protect themselves. When the time is right, they emerge from their turrets through dime-sized exit holes. Like digger bees, cicada killer wasps (Sphecius speciosus__) work alone. They burrow egg-laying chambers in the soil, with the excess dirt creating horseshoe-shaped mounds around their entrances. After stinging a cicada with paralyzing venom, the wasp drags it into a chamber, lays an egg and seals the two together so the larva has an immediate source of food. Of all insect-created mounds, mole crickets' (Scaptericus spp.) are the most likely to be mistaken for the work of animals. Haphazard, finger-wide linear mounds rising just above the soil's surface belong to these strange, shovel-limbed creatures. Mole crickets <ahref="http: 1="" 460="" 620="" 27959390="" www.koco.com="" image="" view="" -="" medres="" maxh="" maxw="" d44vka="" mole-cricket-jpg.jpg"="" target="_blank"> </ahref="http:>add insult to injury by eating turf-grass roots during the day and emerging at night to eat the grass itself. Among the white grubs common in so many turfgrass lawns are Green June beetle larvae (Cotinus nitida), recognizable from their exceptionally short legs and ridged backs. By turning upside-down at night, they use these ridges to crawl to the surface and dine on lawn thatch, grass clippings and grass. They leave behind thin, patchy turf and mounds of powdery dirt.